Abstract: The flaky pastry machine is a type of food machinery. Currently, the electrical configuration of the flaky pastry machine on the market is generally controlled through PLC plus analog and communication modules. This method is more complicated and costly to configure. This article describes an electronic control system for shortbread based on the Quartet V350 frequency converter. 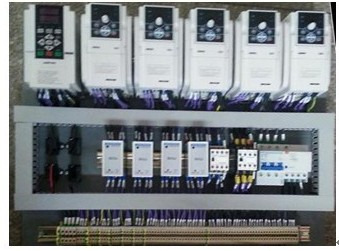 The system omits the PLC and the module, that is, it achieves the technological requirements of the shortbread machine and also reduces the system cost. I. INTRODUCTION The shortbread machine is composed of two main machines, a filling machine and a kneading machine. Compared with the ordinary flaky pastry machine, the machine host integrates the dough machine and filling machine, making the whole process more convenient and smooth. The past flaky pastry machine has low output, high labor cost, and relatively high consumption, while the variable frequency stepless speed governing device can realize any ratio of fur and stuffing, greatly reducing the manual demand and effectively controlling The consumption in production. The dough passes through the rolling and rolling of the two rolling surface rollers and the rolling device to make the dough more glossy and the quality more stable. Each pressing wheel has a thickness adjustment device to set the thickness of the dough to increase or decrease the weight of the product; the dough is controlled by the proximity switch between the pressing surface wheel and the thinning device, so that the dough cannot be transported by the host. 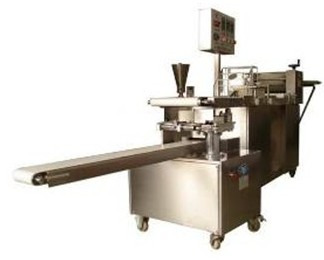 Too fast and broken or too slow to clog; after the last machine pressing surface wheel, the dough will fall on the host conveyor belt, and stuffing parts will be added to the filling, and then the dough will be rolled into strips through the reels and auxiliary reels; finally After the kneading machine molding, the molding machine can set its cutting length to determine the length of the product size and weight, the entire processing process shown in Figure 2. 3. Comparison of new and old solutions The stable operation of the equipment determines the pros and cons of the system solution. The pros and cons of the system solution determine the configuration of the system. V. Summary Through the actual production and application, the program is applied to the flaky pastry machine, the system has a faster response speed, a higher precision of the steady speed, and reduces the system cost. Practice has proved that the integrated system solution introduced in this article is a high stability, reliable performance, can meet the modern requirements of the shortcake machine electrical system program. 1. "V350 Series Low-power Closed-loop Vector Inverter User Manual" Shenzhen Sifang Electric Technology Co., Ltd. 2. "E550 Series Low-Power General-purpose Inverter User Manual" Shenzhen Sifang Electric Technology Co., Ltd. 3. 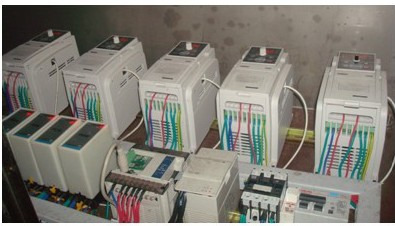 "A310 Food Machinery Expansion Card User Manual "Shenzhen Sifang Electric Technology Co., Ltd.
1. Structure: Panels and base frame are made from galvanized steel protected with polyester powder painting to ensure total resistance to atmospheric agents. 2. Compressor: Hermetic scroll type compressor, equipped with the crankcase heater and thermal protection with thermal overload cut-out and crankcase heater mounted on rubber vibration isolators. 3. Axial fan: External rotor type axial fans, equipped with single phase direct drive motors, low noise 6 poles, protection level IP54, provided with a protective outlet grille. 5. Condenser Coils are consisting of seamless copper tubes mechanically expanded into blue hydrophilic aluminum fins, 100% fully quality tested; sub cooling circuit to prevent freezing at the base (optional); protected with metal grill. 6. Desuperheater: High efficiency stainless steel brazed plate heat exchanger, factory insulated with flexible close cell material(optional). 7. Refrigerant circuit: Copper tube connection with charge valve, filter, sight glass, gas-liquid separator, thermostatic expansion valve, low pressure switch with automatic reset, high pressure switch with manual reset. 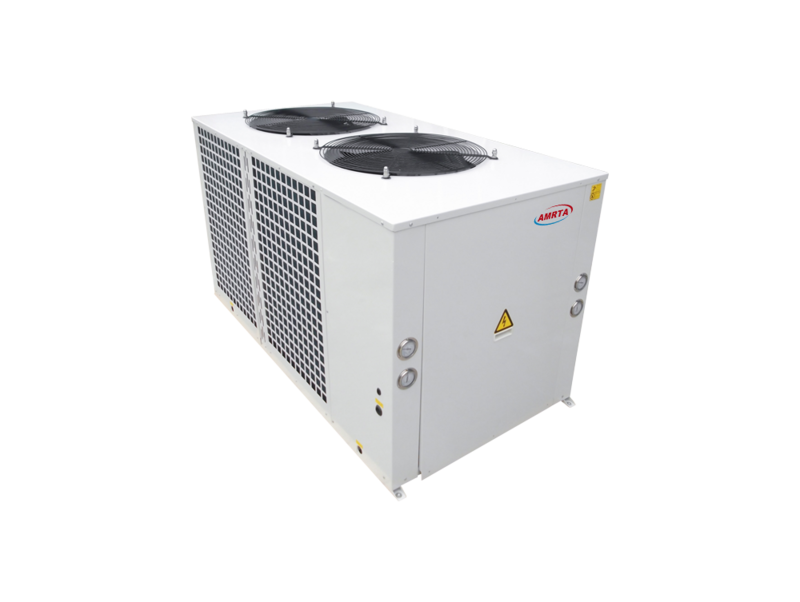 The heat pump unit is completed also with 4-way valve, liquid receiver and one way valve. 10. Optional: Additional electric heater embedded in the coils for defrosting in low temperature ambient. 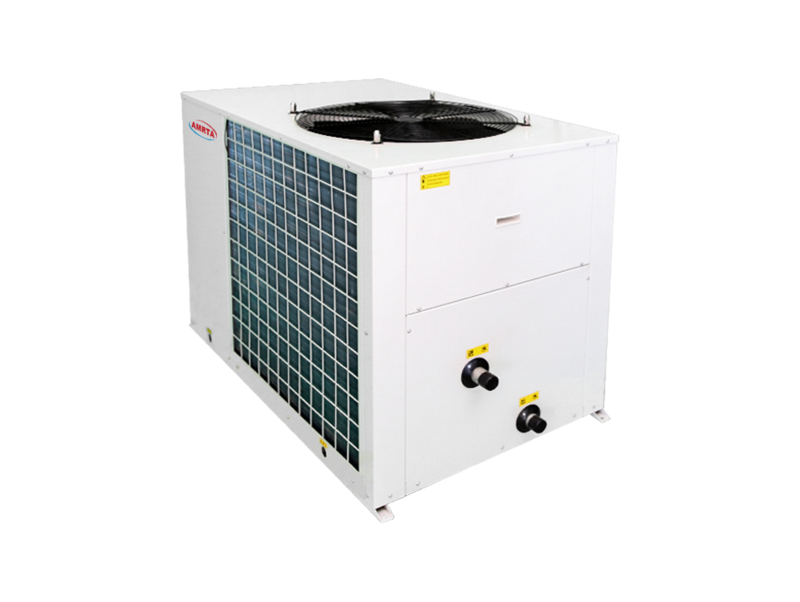 It must be factory installed; Stainless steel covering; Remote condenser; Tube in tube heat exchanger; Water circuit electric heater.